Part of what makes Florida such a challenging state politically is its fast-changing and ever-growing nature. Statewide candidates must constantly introduce themselves. Bush, for instance, won his two gubernatorial races by huge margins — nearly 11 percentage points in 1998 and 13 points in 2002 — but Florida is vastly different now. The Florida Democratic Party still has the voter files from those Bush elections and can pinpoint which voters are still around and which aren’t. Only 28 percent of currently active Florida voters participated in either of Bush’s past two elections and only 13 percent of today’s registered voters are Republicans who voted in those 2002 or 1998 gubernatorial races. “There has been so much growth in Florida, that 13 years since his name was last on the ballot, only around 18 percent of registered voters in Florida ever could have voted for Jeb,” Joshua Karp of the Florida Democratic party extrapolated. Nor have Bush or Rubio ever run in a presidential election year, when Democratic turnout is far higher than in off-year elections. Barack Obama narrowly won Florida in 2008 and in 2012 after mounting the largest and best-funded campaigns ever seen in the state. That Obama barely eked out a win against Mitt Romney, who had antagonized many Hispanic voters with his clumsy talk of self-deportation, might suggest Bush or Rubio at the top of the ticket would all but ensure Florida’s 29 electoral votes for the GOP. “Nothing in life is a lock. But Jeb Bush beats Hillary Clinton in Florida hands down. I don’t care what the polls say today,” said former House Speaker Will Weatherford, R-Wesley Chapel, suggesting Rubio would be formidable, too, but has less broad appeal. What the polls say today is that Clinton vs. Bush is a toss-up. A Quinnipiac University poll released this week showed Clinton leading 45 percent to 42 percent, while a Public Policy Polling survey released last week found Clinton leading 47 percent to 44 percent. She led Rubio by 2 percentage points in both polls. I think she has a glass jaw, and I’ll be really blunt. I don’t think she’s going to be the next president of the United States. Everybody acts like she’s inevitable. But I know a lot of people very close to Hillary Clinton that are very worried right now that she has what it takes to win a general election. They think she’s going to win a primary, the Democratic primary, but they’re very worried. And think about it, Hugh. Everybody’s been talking for four years about how the Democrats are stacked against the Republican Party, there’s no way we’re going to win nationally again. 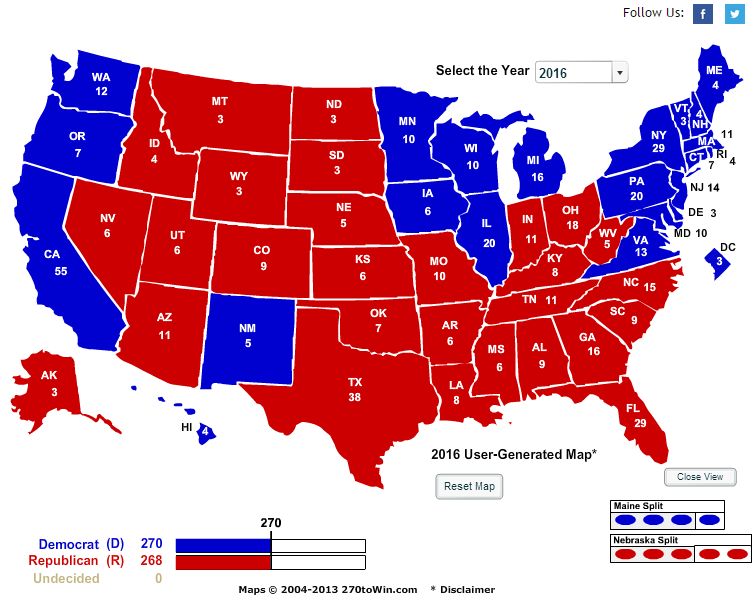 All we need is somebody to win all the states Mitt Romney won, which is a pretty low bar for the Republican Party. And then you win Florida, Virginia and Ohio, which I think any of these major candidates can beat Hillary, and then you just have to pick up four electoral votes. And there are about ten states that Republicans can win there. I’m actually feeling very bullish on 2016 right now if we nominate the right guy or woman. Democrats, meanwhile, seem ready to cede the whole thing to Clinton, who, for all her experience and intelligence, may be a less-than-ideal candidate. Even her e-mail problems, which polls at first suggested could be shrugged off, aren’t going away. It didn’t help when her lawyer, David Kendall, in response to a subpoena from a congressional committee looking into the 2012 attack on the American Embassy in Benghazi, told the Times, “There are no hdr22@clintonemail.com emails from Secretary Clinton’s tenure as Secretary of State on the server for any review, even if such review were appropriate or legally authorized.” That her personal e-mail server has been wiped clean of any records from her years at the State Department erases the chance of anyone ever making an independent study of their contents and is bound to encourage the suspicion that there was something worth hiding. The investigation community is like a perpetual scandal-seeking machine, quick to seize on any hint of inconsistency, and both Clintons, understandably, are weary of being pursued by those who don’t wish them well. But the public may be getting weary of seeing the words “Clinton” and “lawyers” juxtaposed yet again with any sort of frequency, which could explain her slippage in the polls in three battleground states. Not long ago, Ryan Lizza wrote about Clinton’s aura of inevitability and the historic failure of most challenges to strong front-runners. At this point, though, any insurgencies are more notional than real. Martin O’Malley, the former Maryland governor, has been gently critical of her as he shyly contemplates getting into the race. The former Virginia Senator James Webb, who began exploring a run last November, is still hinting that he intends to run. But when you look for signs of the Webb campaign, which promised a fresh view of income inequality, military commitments abroad, and the terrible waste of lives—mainly black lives—caused by mass incarceration, what you’re likely to find is the status of the James Webb space telescope, which will replace the Hubble. (That Webb ran NASA in the years of the Apollo program.) Clinton, meanwhile, has not exactly announced her intentions, but her campaign, without coyness, has reportedly leased two floors of office space in Brooklyn Heights, and that, as Politico notes, may be regarded by the Federal Election Commission as the beginning of a campaign. Four years ago, Democrats were amused by the Republicans battling through the primaries, and by debates that even Republicans considered a “clown show.” This year, Republicans may be cheered by the absence of battle on the other side, by the sight of a major political party diminished by timidity and the uncertain candidacy of a single contender. Former Florida Gov. Jeb Bush scrapes past Clinton with a three-point lead, still within the margin of error, in a hypothetical head-to-head matchup in Florida, according to a Quinnipiac University poll released Tuesday. Clinton had a one-point edge in the Florida dead heat Quinnipiac reported in early February. The last two months have also erased Clinton’s previously double-digit lead over every other potential GOP contender for the presidency in Florida, Ohio and Pennsylvania. Sen. Rand Paul, the libertarian-leaning Republican from Kentucky, is now the man to beat in Ohio after he narrowed his margin against Clinton to just a five-point deficit, according to Tuesday’s poll. Paul, who is expected to announce his bid for the presidency next week, trailed Clinton by 12 points in Quinnipiac’s early February poll. Every potential 2016 Republican contender included in the February survey has since gained on Clinton in Ohio — even if by just two points, like in Bush’s case. Paul is also winning over Pennsylvanians, trimming his 9-point deficit to a virtual tie, landing 45% of support to Clinton’s 44% in the state. Clinton remains a strong favorite — especially so early on — against virtually every other potential Republican contender for president in the three battleground states. But it’s clear Clinton’s email scandal — first that she exclusively used private email housed on a private server as secretary of state, and then that she deleted all the emails on that server — has leveled a hit to Clinton’s public image and trustworthiness, according to the Quinnipiac poll. About half of voters in all three states say Clinton is not honest and trustworthy — by a 5-to-4 margin in Florida and Pennsylvania, with a closer split in Pennsylvania. And Clinton’s favorability rating has also slipped in Florida — to 49% from 53% — and Pennsylvania — now at 48% from 55% — though she still gets more favorable reviews than all of her would-be Republican opponents, except for Bush and Florida’s Sen. Marco Rubio in that state. Despite denials over the significance of the email scandal by Clinton supporters , the poll found that, “Clinton has provided satisfactory answers on the e-mail issue, 38 percent of voters say, while 55 percent say serious questions remain.” This is also the sort of matter which most people are not currently paying attention to at this stage, and could be much more harmful in 2016. Despite the attempts of Clinton supporters to claim this is a trivial matter, this is actually an important matter which gets to the heart of Obama’s efforts to improve transparency in government in response to the abuses during the Bush years. With so much communication now being by email rather than written memos, it is also important to the historical record that these records be maintained. Hillary Clinton’s integrity is tarnished by her failure to follow the rules placed in effect in 2009, her false claims at her press conference of following the rules, and her debunked claims of having failed to use government servers in order to avoid needing to carry two email devices, even though she actually did use two different devices. Clinton’s attacks on Republicans for shredding the Constitution when they used a server from the Republican National Committee, and the citing of use of personal email as one reason for the firing of an ambassador under her, strengthen the view that the Clintons believe that the rules do not apply to them. How many voters are really going to believe that Clinton was not hiding something after she not only violated the rules but wiped the servers? While many Democrats have been willing to back Clinton, despite being out of step with liberals on the issues, because of the feeling she had the best chance to win. Now that she is looking like a weaker candidate there has been increased discussion of the possibility of other candidates taking on Clinton for the Democratic nomination, but so far there has been little action by other Democrats. Martin O’Malley is currently the only one making serious moves towards a candidacy. While the Clintonistas have begun their inevitable campaign against him, he is starting to get favorable coverage. Some Clinton supporters deny how Clinton is to the right of O’Malley and most other Democrats, using flawed rating systems which do not mean very much when most Senate votes are along party lines. (Republicans used such bogus arguments to claim in 2004 and 2008 that John Kerry and Barack Obama were the most liberal Democrats.) Clintonistas have an even more difficult task when pitting O’Malley against Clinton based upon competence. A. H. Goodman argues at The Huffington Post that O’Malley or Elizabeth Warren, along with other possible Democratic candidates, can beat the Republicans. In Iowa, which has not been a strong state for the Clintons, some are seeing O’Malley as the nation’s new JFK. Joe Biden has the advantage over other potential challengers in terms of name recognition against other potential candidate, but has made only very preliminary moves. While he has not taken any actions towards organizing a campaign, a Draft Joe Biden site has started. If Biden plans to run I think he bypassed an opportunity this week. Biden was often the voice of reason, in contrast to Clinton’s hawkishness, in the first four years of the Obama administration. If he was interested in taking on Clinton, I would think he should have reminded voters of Clinton’s opposition to Obama’s desire to engage in diplomacy with Iran. This issue might still come up, being yet another example of how long it often takes for Clinton to learn from her mistakes. With many months to go before the first primary, there remains hope that other candidates will emerge once it no longer looks like resistance to Clinton is futile. Sources from Salon to The Christian Science Monitor have offered suggestions as to alternate candidates for the Democratic nomination.